I pulled out a pattern I have been meaning to try – Very Easy Vogue 8815. 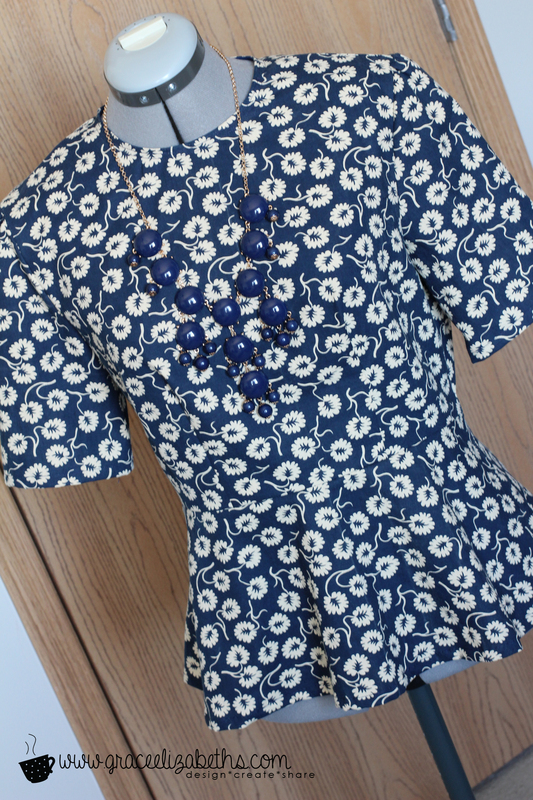 I have wanted to make a peplum top for quiet some time now! 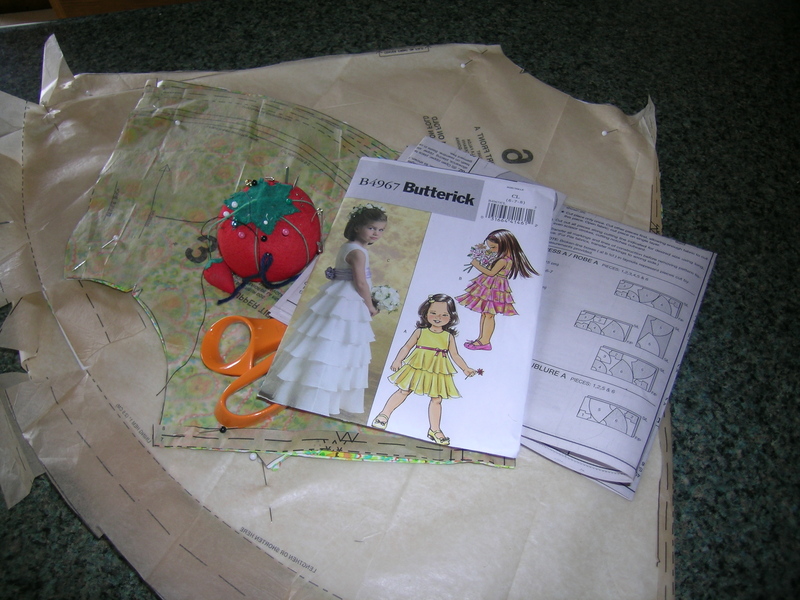 I chose to make view B.
I pulled out some left over material from another project – the only item I had to buy was the zipper! Sometimes I worry that I have too many craft supplies that have no intended purpose/project. However, it’s nice to open up my stash and shop from home! After getting the pattern and fabric cut out, the top came together very quickly! I like the elbow length sleeves and stylish peplum. One thing I would change for next time would be to lengthen the peplum – it could be more flattering if it were to hit my body differently. I am looking forward to adding this to my work wardrobe! I have yet to wear it…when I do I’ll be sure to add a picture! What new fashions are you looking to add to your wardrobe? Summer and knitting – do they go together? Well they do if you plan on knitting something to keep cool in these hot humid summer days. Each summer I like to knit at least one item that I can wear to keep cool. 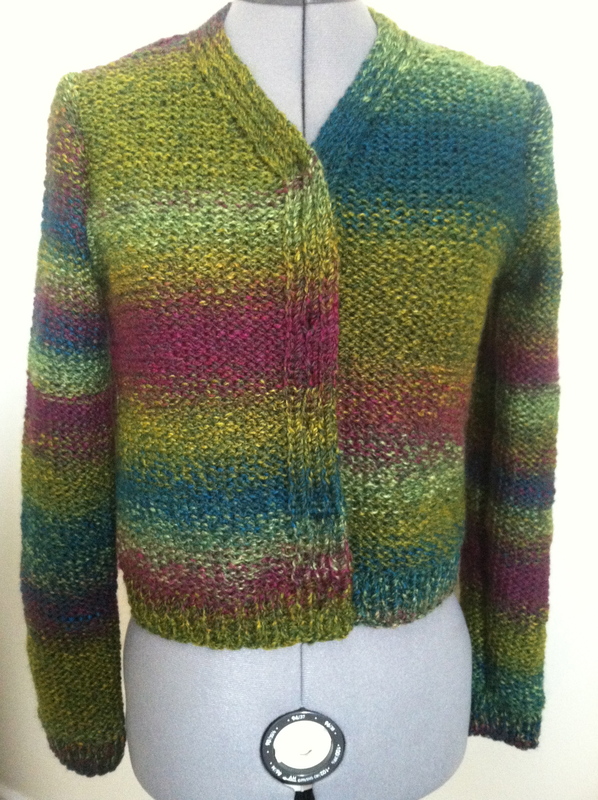 This year I chose a pattern by Patons: the Sunny Days Tank. While browsing a local yarn shop I came across a lovely yarn by Louisa Harding Yarns called Merletto. Its unique texture is accented by the sheen of the viscose strand twisted with the matte linen strand. I chose Lagoon for the color. The weight is DK . 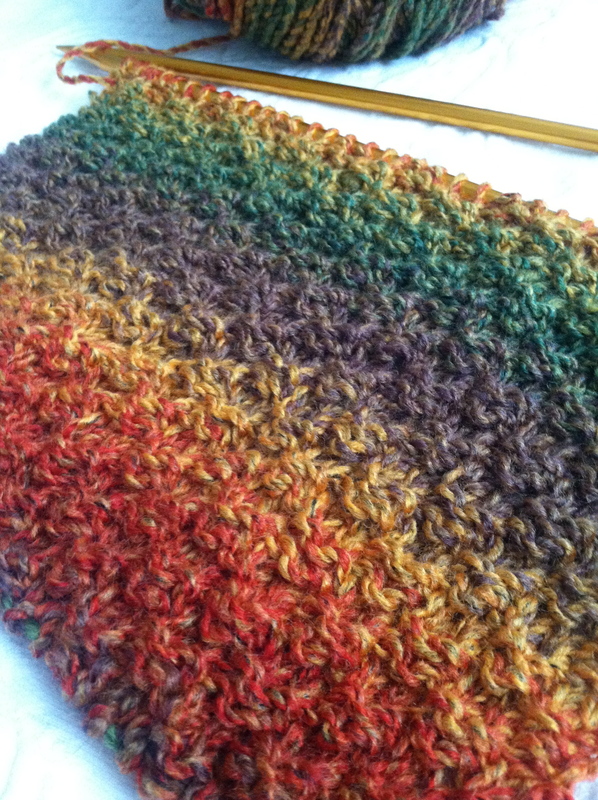 I prefer knitting with worsted weight or larger for garments because I can complete a project faster. However, sometimes one has to bite the bullet and just go for it. After making my gauge I discovered I needed to make a few minor adjustments to the pattern. I am not always very good at this but it worked and I am very happy with the fit. What I love most about the tank is the lace pattern that adds detail to the bottom. What are you knitting this summer? I love it when people ask me what is on my knitting needles today. I usually have a couple of projects going at the same time: one large project and one small project. Socks are my typical small project, however today I have a cowl on my needles and my large project really is not on needles. It is a cardigan which is complete except sewing on the pockets, buttons and knitting the optional Festive Fur collar. Unfortunately I am not happy with the body length. It is really a jacket but seems too short even though I added an 1″ to the length. It looks great on the mannequin but God made me with a long torso. What do you think I should do? I am considering a peplum. Have you ever bought yarn for a project for yourself and then turn around and give it to someone else instead? This is what happened to me during the holidays. I had taken inventory of my sock drawer and decided that some of my ready-made socks were nearing the end of their lives. 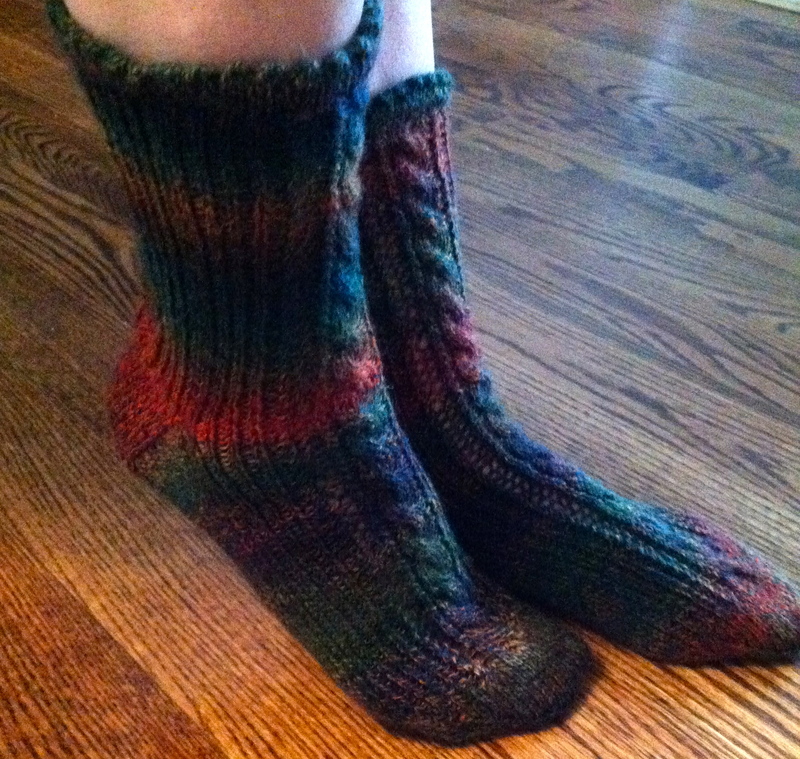 Oh darn – I need more socks to replace them and I want them hand-knitted. High on my list was brown socks. I have a couple of brown pants that I always wear with basic, no thrill brown socks. I was excited for my next yarn shopping adventure. Ok, I admit, I am not like my husband with a mission in mind when I go shopping. I do not walk in the store, seek out the “sock” yarn, find what I want, buy it and I’m on my way. No, during my yarn shopping trip I looked through the entire yarn department touching, feeling and petting several of the skeins as I passed through the isles. I dreamed up all the projects I could knit or crochet with this lovely yarn. “Earth to Sonya, earth to Sonya” – oh ya, I was shopping for sock yarn. I cleared my head and started to focus on my mission. I reached my destination and was SOooo…disappointed in the small selection. Yep, when you bop into a box store you can’t expect much and my town doesn’t have a yarn shop. I made my selection – not brown – they didn’t have brown but I am partial to self-patterning yarn so Clover Colors it was by Patons. As you can see it has greens, reds, blues and a touch…a hint…a scant…ok…no brown. Hey, give me credit I searched the entire yarn department. During our family Christmas we somehow began talking about hand-knitted socks. 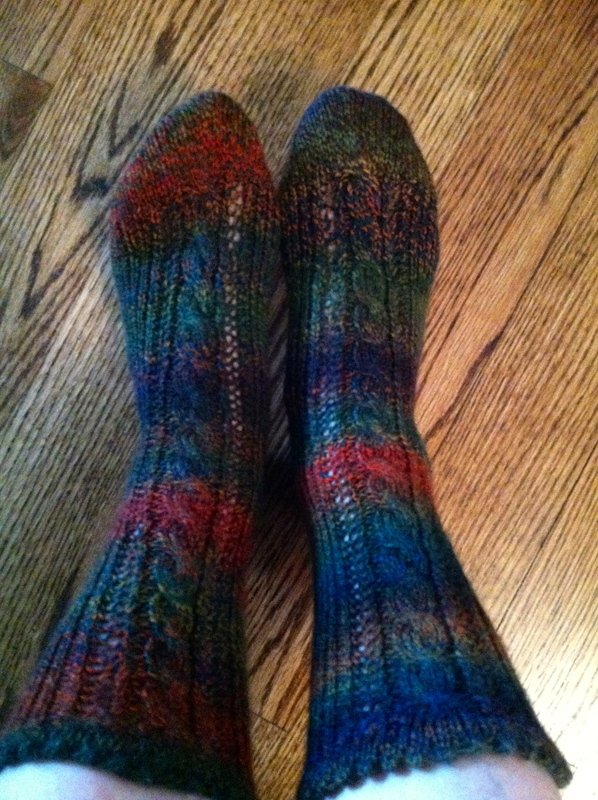 Alex, my oldest daughter, piped in and said, “hey, you have only made me one pair of socks and some slippers. 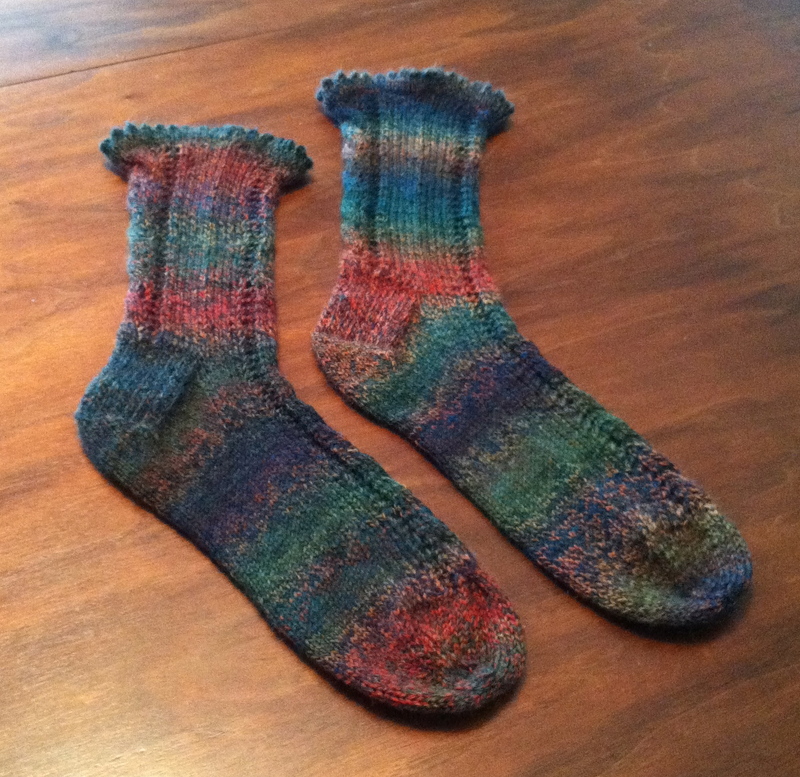 I want another pair.” To the studio I marched and pulled out the “not so brown” sock yarn and asked if she would like a pair made out of the yarn. It was a YES! She selected a pattern and now my socks were hers. I love the way they turned out. I had made the pattern before – oh funny – they were made with a brown tweed. 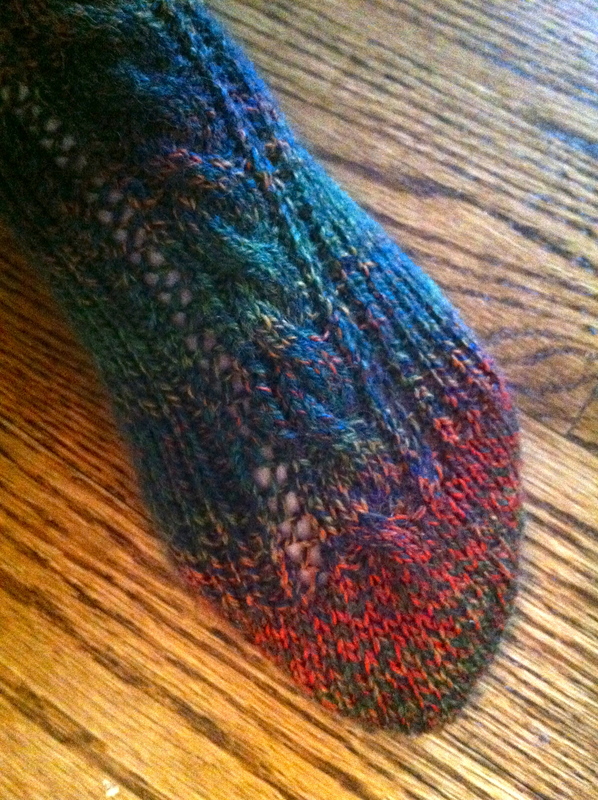 I disliked the mock-cable which the pattern called for so I changed it to a true cable. Hey, I knit like I cook. If I don’t like the recipe, I change it. I know there is more like me out there. Back to the pattern – I do really like the true cable. I also like the picot edging. It adds a nice finishing touch to the top. What do you think? From all of us at Grace Elizabeth’s I would like to say “Happy New Year!” A new year always gives me the sense that I can start over, start fresh and enjoy looking to the future and all the good things to come. On a recent trip to the quilting store (an hour away) Alex and I were discussing how we really have dropped the ball on posting to our blog. Life seems to get busy. We had a wedding (Alex), we moved into a new permanent home and a temporary home (I would not recommend maintaining two households) and had a collage graduation (Alex). During the holidays I spent some time reading some blogs I enjoy following. The more I read the more I began to feel a little lazy. Where do all you young moms get the time to craft, blog, cloth your children with the most darling creations, make delectable meals and desserts and oh yes, sleep. Ok – you have motivated me. Projects are swarming in my mind and I am not getting much sleep. It’s time to take action. I’ve started a few projects and I hope to start blogging about the finished projects soon. Until then, I was busy for a couple of weeks making scarves for the ladies at my husbands work place. It was a last minute thought and I now have had my fill of making scarves for awhile. I made a total of 9 scarves (I kept a couple for myself).